A black hole is the ultimate void, a vast, dark vortex of emptiness with an unimaginably dense center from which nothing can escape giving off wild bursts of light and energy as time, matter, and space are all condensed into infinitely hot meaninglessness. 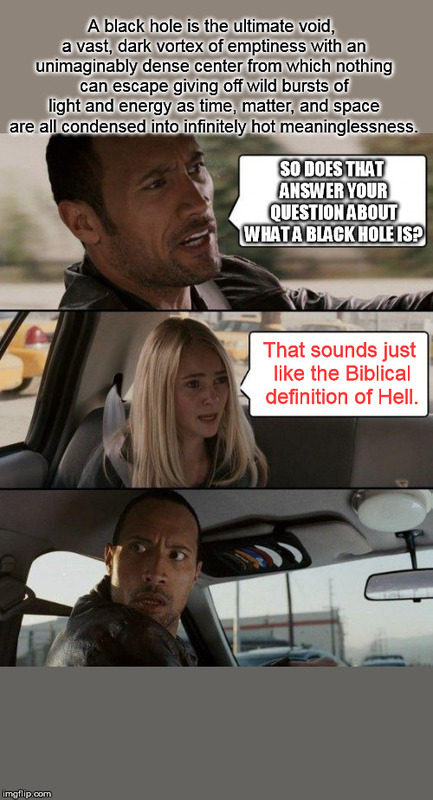 SO DOES THAT ANSWER YOUR QUESTION ABOUT WHAT A BLACK HOLE IS? That sounds just like the Biblical definition of Hell.